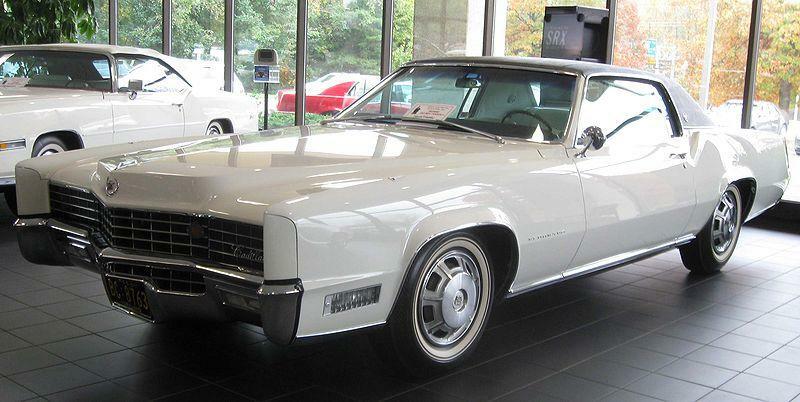 The success of the Buick Riviera and Oldsmobile Toronado didn’t escape the attention of Cadillac executives. They wanted a personal luxury car and 1967 proved to be the right time for Cadillac to make their move. This car was loosely based upon 1966 Oldsmobile Toronado “GM E-Body” technology, but used Cadillac’s own engine and exclusive sheetmetal along with a slightly longer wheelbase and revised frame. The Toronado-type front torsion bar suspension was broadly carried over and shared, as was the special Turbo-Hydramatic 425 automatic. A silent but massive hy-vo chain carried the power 180 degrees from torque convertor to transmission (which nestled under the right bank of the V-8). The final drive was in front of the transmission, and the left driveshaft was routed through the oil pan. GM Styling Chief Bill Mitchell was responsible for the styling, and it was decreed that the car would be built exclusively as a two-door hardtop. Performance was very good, with 0-60 in less than 9 seconds (not bad considering the 4,700 pounds plus weight) and top speed was in the vicinity of 120 mph. Drivability and handling were lauded in road tests of the day, and 17,930 units sold helped Cadillac to a best-selling year. Front disc brakes were optional. 1968 cars had minor changes, along with a larger, all-new 472 cubic inch V-8 engine using much improved foundry techniques and hollow crankshaft. This engine belted out 375 hp and seemingly enough torque to topple the Washington monument at will. Front disc brakes were made standard. 1969 and 1970 cars were carry-over cars with a few improvements. Notably, the 1970 car obtained an enlarged 500 cubic inch V-8 boasting 400 horsepower, and probably enough torque to pull down the Chrysler building.